PMS Tea is an herbal tea for relief of temporary water weight gain and bloating associated with the premenstrual period. Active Ingredients: Dandelion root 500 mg., chicory root 200 mg., uva ursi leaf 80 mg., cornsilk style and stigma 40 mg.
Inactive Ingredients: Roasted carob bean pod, barley malt, oatstraw herb, parsley leaf, nettle leaf, chickweed herb, cramp bark. Please check with your midwife or physician before using this product during breastfeeding. Now on Sale! 40% off! now only $3.36 CAD! as if every part of me had been made to hold you." ~Alicia Bayer from "To My Child, On Mother's Day"
Great for relieving pain during labour! These are the best thermal packs around! The Wraps are filled with small, soft flowing grain that molds and hugs itself to your body. The fleece is comforting against the skin whether the wrap is hot or cold. The grain is contained in several pockets to avoid the grain sliding all to one side and becoming cumbersome. With Herbal hugs the heat is always distributed evenly, offering wonderful soothing relief from pain! Scented with aromatherapy herbs to help ease tension. Base Ingredients: Mixed grains (including wheat, flax. May also contain some oats, grass seed, buckwheat). Dried herbs. Essential oils. There is absolutely no way that I could have gotten through my 4 pregnancies without this heat pack. Only 2 minutes in the microwave away from relief from all of those pregnancy induced aches and pains. It even helped ease my sciatica. During labour it provided wonderful relief from back labour pains. An absolute must for every pregnant mama! 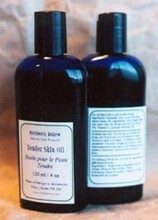 Full of oils that are fast absorbing and are reputed to help the skin repair itself, this is a must in any household. With this powerful oil blend from nature, a little goes a long, long way. (calendula flowers, yarrow, witch hazel bark, comfrey leaf, marshmallow, olive oil, beeswax) Shrinks haemorrhoids and relieves itching. I recommend keeping the jar in the refrigerator for even more soothing relief. (camomile, calendula, oats, comfrey leaf, jasmine flowers) Formerly "Relaxing Bath". A fragrant bath with wonderful soothing and healing properties. The oats in this bath smooth the skin and take the itch out of rashes. My favourite soak after a long day! A muslin bag is included in each resealable bag. The fragrant bag of herbs can be used as a cleansing sponge in the tub. Contains about 4 baths. Now on Sale! 50% off! now only $4.35 CAD! Ok, I admit that this is not a "must-have", but boy is it ever an "absolutely lovely to have". I love to take a nice long soak after a hectic day. These days Diarmuid joins me, and it's nice to know that this bath is good for his tender skin too. Mamas work hard all day, pamper yourself when you can! You know that you deserve it, and your family will only thank you for taking the time to be a more relaxed and peaceful mama too. Revitalises tired feet and helps to keep them comfortably dry. Non-greasy, it keeps the skin feeling smooth and firm. What could be more wonderful in your third trimester of pregnancy or after tiring day of chasing after your little ones than a nice foot massage? Now on Sale! 40% off! now only $10.37 CAD!